I survived Black Friday and Cyber Monday – did you? Last week was pretty crazy with menu planning, grocery shopping, cooking and family, but a good kind of crazy. It wasn’t until Friday afternoon that I finally found some time to sit at the sewing machine. 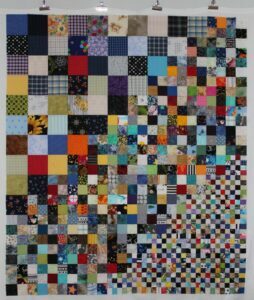 A stop at the local quilt shop provided me with some help in selecting the inner and outer border for the One Block Wonder. We decided on a grayish green for the half triangles for the top & bottom and a soft black batik for the outer border. Friday I cut out all the half triangles and sewed them to the columns. Any spare time on Saturday and Sunday was spent sewing the columns together, so now I have this on my design wall. My plan is to incorporate some of the leftover hexagons into the outer border. Hopefully the top will be finished by the end of this week. 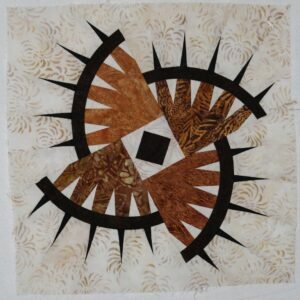 There has been progress on my leader/ender projects – Four Patchwork is now a completed quilt top. Currently I am sewing basket blocks as leader/enders for Charlotte’s Baskets quilt top. 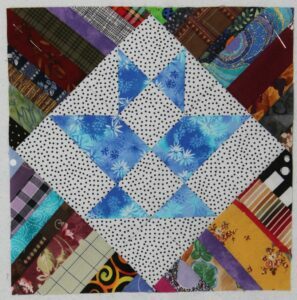 I wanted a basket block with more background than the one shown in the pattern, so I substituted Fancy Basket from Bonnie Hunter’s Addicted to Scraps column in Quiltmaker $168. This top should come together quickly since all the string triangles are ready. Probably the most exciting thing to happen on Friday was that I now have an answer to my problem with the Rocky Mountain Bear Claw. 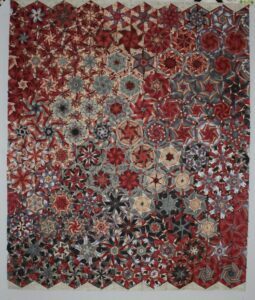 I received an email from a quilt store that said that they would have people around on Friday to answer questions or help with a Judy Neiemeyer pattern, so off I went. As you recall my block looked like a volcano (the sales lady called it a D cup) and the answer was to aggressively steam the block flat. Now I am a dry iron kind of gal, so this approach didn’t occur to me. But as you can see it worked, so this must be the way to deal with it. I am glad to get an answer and as soon as the OBW is finished, I will be working on the bear claws. Hopefully I will be able to find enough time to finish these projects before the end of the year.